The first thing to come to mind when somebody mentions the word Croton I instantly think of Southern Florida. From what I have witnessed it must be one of South Florida’s most popular shrubs and this is due in part to a long history with the plant. For others, the first thing to come to mind might also be a place more tropical. California most likely falls pretty far down the list of first thoughts. However, there are Crotons in Southern California and “Crotonheads” (as they like to be called) can be found here growing them in their gardens. 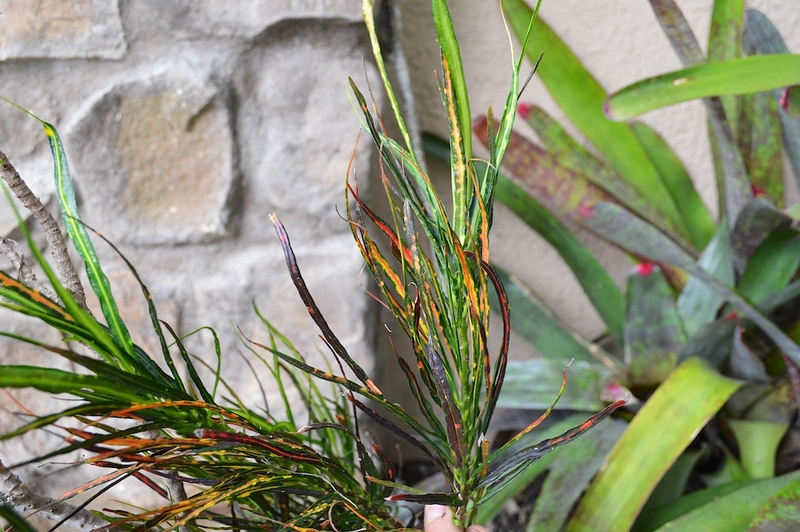 Native to Southeast Asia, Crotons (Codiaeum variegatum) do surprisingly well down to a USDA Plant Hardiness Zone 10a or in a localized microclimate in California. In Florida they can survive in a 9b. 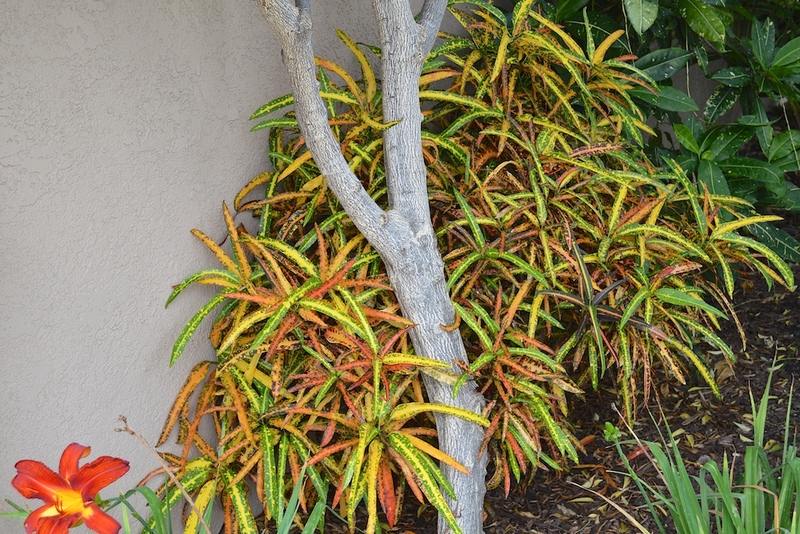 Crotons in Southern California will defoliate in cold winters with frost, and a hard freeze will kill them. So I always recommend that you cover your plants if frost or a freeze is being predicted. For the most part Crotons in Southern California are slow growers. 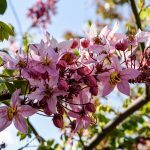 This slower growth is great in that you can keep them to a manageable size in the garden without much effort, but also can be a curse should should a freeze or frost knock them back. For me the fastest Croton in my yard is one called ‘Purity.’ While not the most attractive in my opinion, it is a great grower. 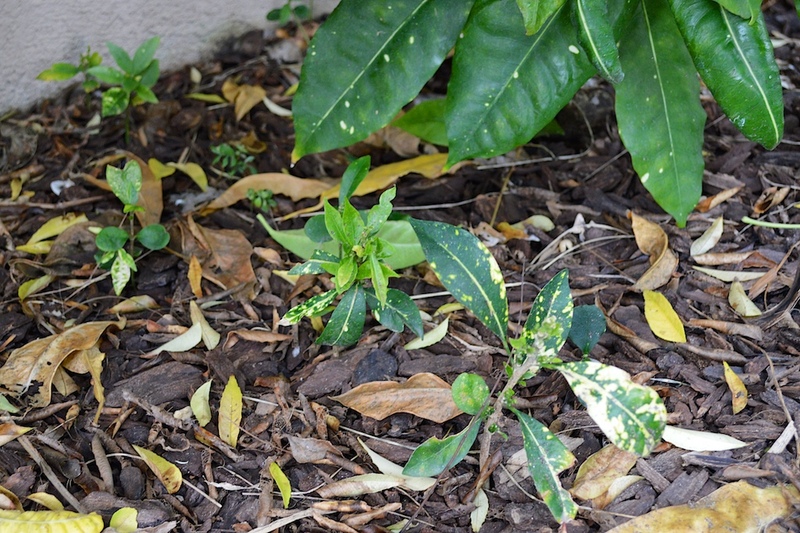 The Croton ‘Purity’ actually does so well here in my Southern Californian garden that its seeds germinate freely in my yard. It is the only Croton that I grow to do this. 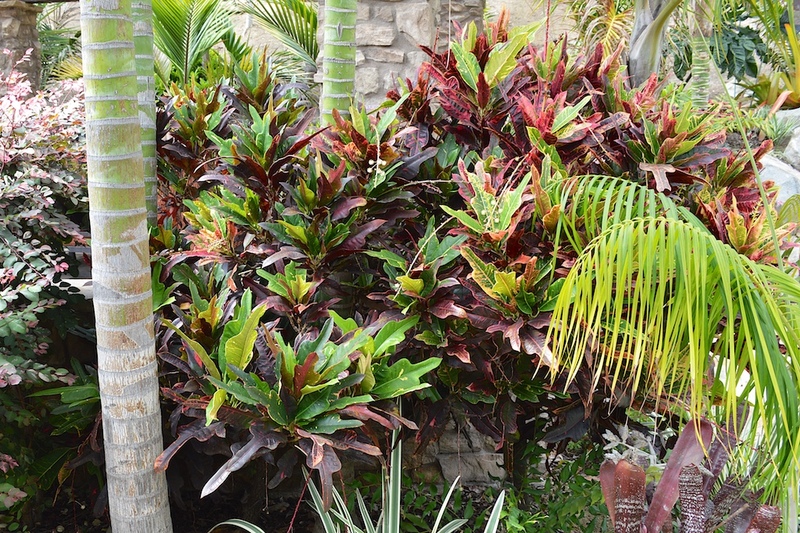 Crotons are grown for their fantastically colored leaves that can be found in a wide variety of shapes. Some are small while others are large. They can be found long and narrow or quite oval shaped. There are croton leaves shaped like an oak leaf, multi-lobed, wavy, corkscrewed or even oddly thin. 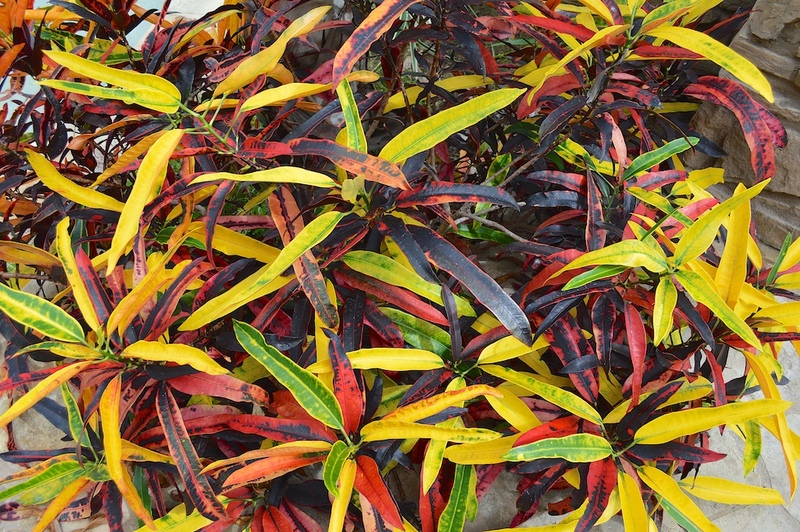 A Croton’s leaf colors are intermingled or mottled with reds, oranges, yellows, purples, pinks, greens, blacks and white. It is for this large degree of variability that there are hundreds of named cultivars and still growing. 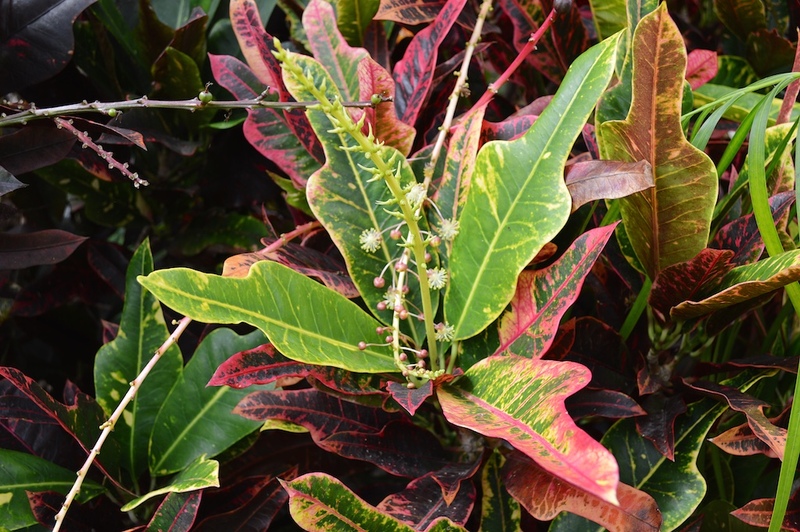 Here we see Croton ‘Mammy’ displaying a broad range of intermingled colors on a wavy leaf. This plant can not help but scream for attention as visitors walk by it on the way to my front door. This is an unknown cultivar that I carelessly lost the tag to years ago. Planted in 2007, these two plants have grown into beauties. 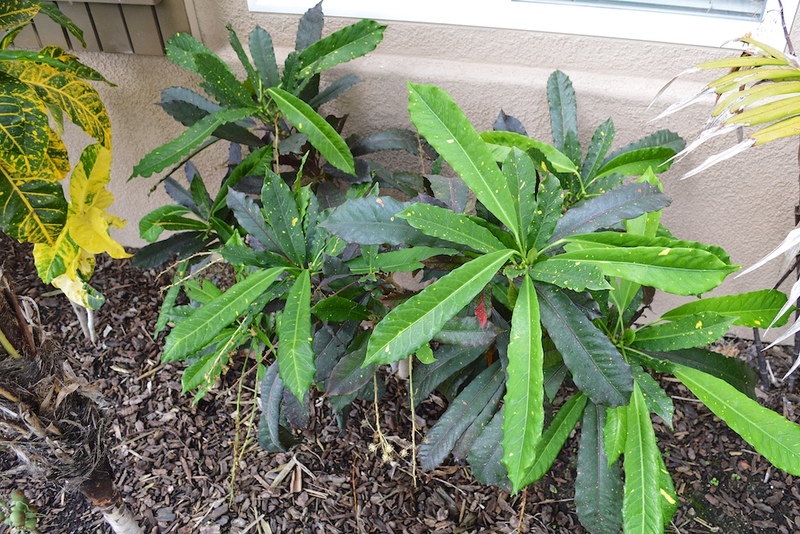 In Southern California you can plant a Croton in almost any light. I find they do best in partial shade or a shifting sun location. Ideally you want some overhead protection or canopy to help prevent cold damage should we see a frosty winter. Thanks in part to overhead protection I have yet to see frost damage on any of the Crotons that I grow. This unknown cultivar is extremely happy under the protection of a Murraya koenigii tree that offers up full, late afternoon sun. I would not recommend that you plant most Croton varieties into full sun. I found that many cultivars will fade in color or burn during the extreme heat and low humidity a Santa Ana event can bring. They also do not grow as healthy in dense shade. Here you see a Croton ‘General Paget’ which is leggy and stunted from not enough light. 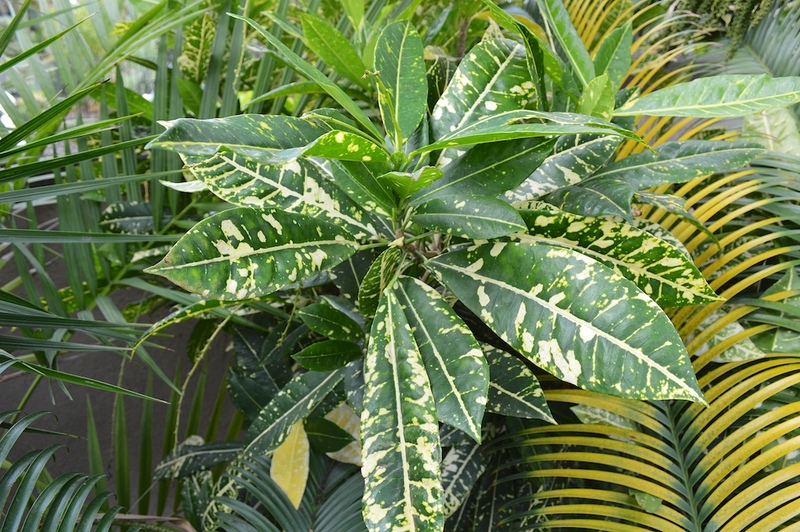 Croton ‘Charmer’ is also planted in too much shade thanks to a quick growing canopy of palms. This is a beautifully colored Croton in a sunnier location. In my garden it is mostly green. 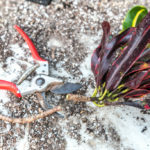 From my experience, Crotons in Southern California are usually pest and disease free, but can occasionally have a mealybug or scale infestation. However, the only plants in my garden to suffer from an infestation were those grown in too much shade and are weak from it. Crotons can grow up to 10 feet tall in tropical locations, but here in my garden I figure it would take more than 15 years for my fastest grower to approach that size. While Crotons can be big, there are some dwarf varieties. Shown below, my Croton ‘Picasso’s Paintbrush’ was planted in 2007 and is still very small. I grow this Croton more as an anomaly rather than for any bold statement. It’s an oddball in the Croton world. 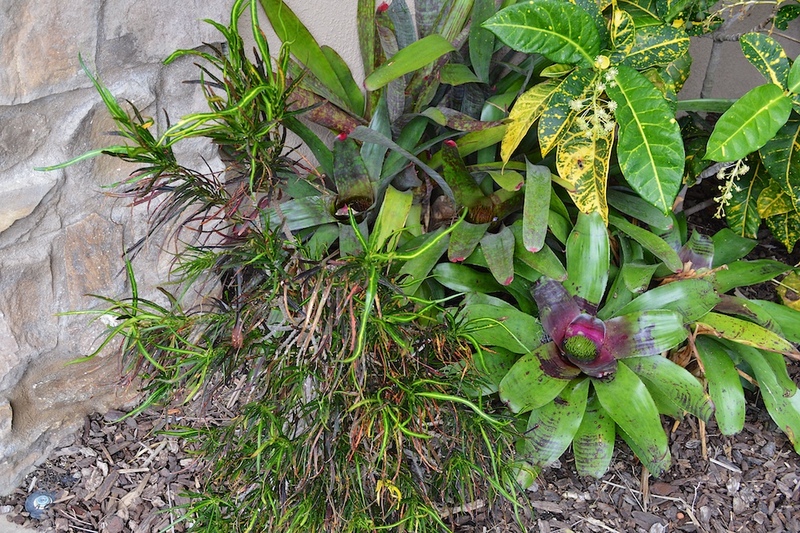 Not surprisingly, I have found that well-draining soils work best for growing Crotons in Southern California. 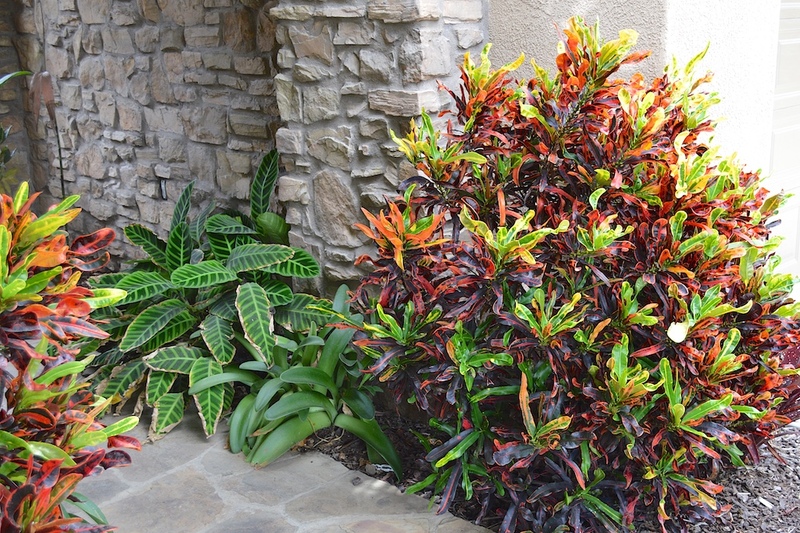 Crotons do not like to dry out when it is really hot, but can be surprisingly drought tolerant when well established. A spinkler valve with a broken wire in my garden confirmed this a few years back. Due to the broken wire not activating the sprinkler valve during scheduled waterings, a zone in my yard was not watered for two weeks one spring. 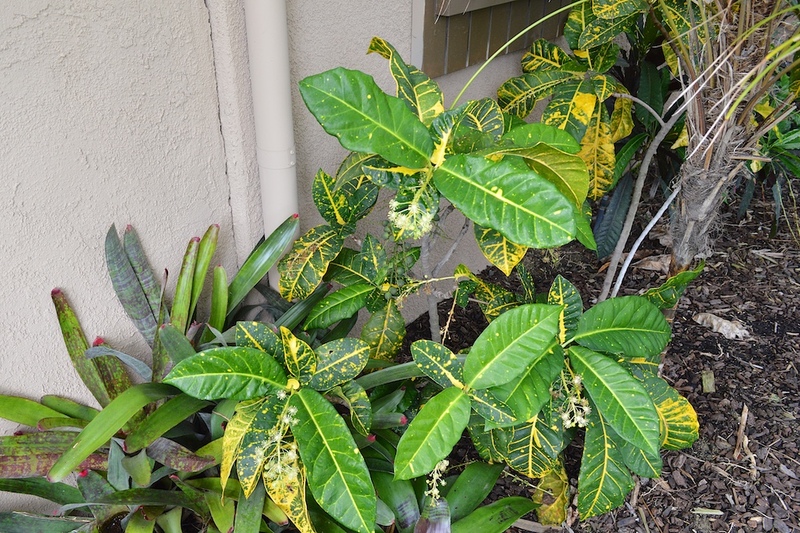 If it had not been for the wilting of some other plants in that area, I never would have noticed my Croton was under stress from lack of water. In the winter I find it very important that the soil go dry between waterings. I have attempted to grow quite a few of the other more Gody cultivars but they did not survive. In almost all cases the plant would die in late winter from the soil being too wet. The cultivars that have thrived in my garden seem to be better adapted at growing with wet feet in the cold, damp soils our winters bring. But even these I like to keep mostly dry if I can in winter. 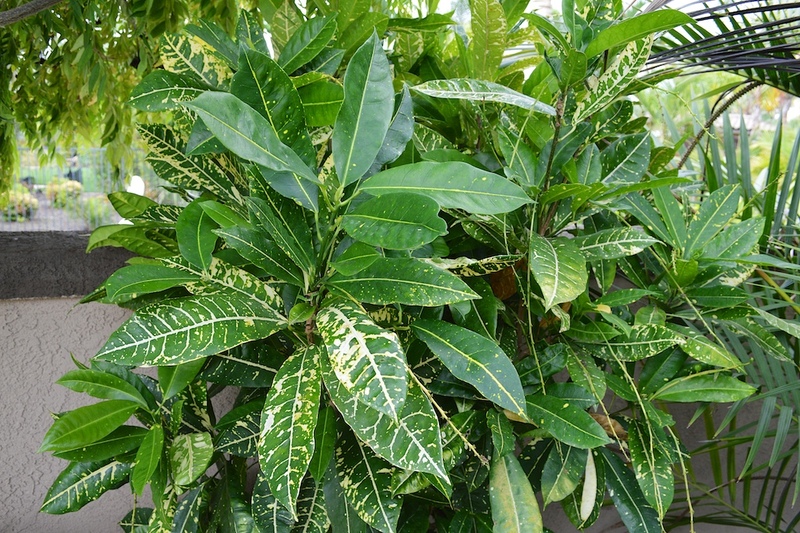 Follow the growing advice I discussed in this blog post and you can end up having a tropical beauty like Croton ‘Stoplight’ growing in your garden as well. Currently, Croton ‘Stoplight’ is my favorite Croton that I grow in my garden. You can see from the picture below where it gets its name. Crotons demand attention with their stunning color that is guaranteed to stand out in a typical mediterranean climate garden. They make such a bold statement that they really need to be found in more gardens in California. Especially if you like the tropical look. I had Mammy survive fine here in the SF Bay area while Petra was nearly killed in the winter. Petra has recovered somewhat. I have heard also that stoplight and the fiddle leafed type crotons are most cold tolerant. I doubt they would ever get to 3′ here, but that’s still a lot of color. Stan, funny you mention ‘Petra’ as I almost included it in my post. It is actually the oldest croton I own. In the almost 10 years I have had it after buying it from home depot it has grown a whopping 2 feet! It is difficult for sure. Thanks for your comments on what grows in San Fran. ‘Mammy’ is certainly a winner. Hi Len, I didn’t realize you were the same Len as in Palmtalk until last night! I absolutely loved your garden photos. Your garden is spectacular!!! I enjoyed poring over each picture thoroughly. The croton under your Murraya is Johanna Copinger, hybridized by the great Henry Coppinger. You can see other photos of it in the Croton Online Reference. I am Annafl on the croton forum and am in charge of the encyclopedia there. Your other unknown is probably one of the AFD’s- 5 or 7. 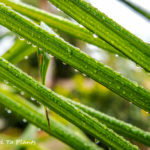 Check out the photos and see what you think. Sometimes they are purchased with other names that will be mentioned in the encyclopedia. 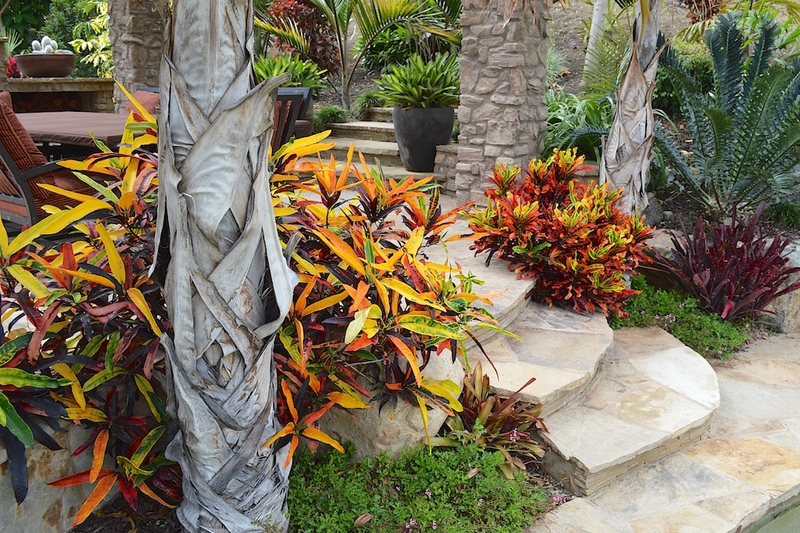 AFD are the initials of the Italian nursery that developed these crotons years ago. Your Stoplight is beautiful! You will see others as well as an old photo of mine in the encyclopedia too. I hope you have fun going through there and checking out the many beautiful crotons. Hi Ana, small world is the plant world 🙂 I use the Croton Online Reference all the time. What a great resource! Thanks for the possible ID as Johanna Coppinger. That plant came from Jeff Searle in 2008. Along with the other two unknowns, Stoplight and Purity. By the way, yesterday I posted a croton (Fishbone) on my facebook page. I frequently post crotons there. Come on over and check it out! I love ‘Fishbone’ – always have. One of my favorites when I toured Jeff Searles garden. He also had one called ‘Jackpot’ that looked great. I love your garden by the way. I get envious looking at what you guys can do in FL. By the way, I’m sure that’s Johanna Coppinger, not sure about the AFD. If you send me your email address, I can send you a photo of the Fishbone so you can see if you want it. I find it to be very cold tolerant here. Has seen 27-28 degrees, with no real canopy there. Jackpot is phenomenal. Not many have that one. Maybe some day I’ll get lucky! Hey Len,I didn’t know where to post this on your blog. I notice that a Maranta has lived for a few years on my porch. What’s your ideas on Marantha,Calathea’s and that whole family? I saw a program where in soucal they had planted along a part shade walkway the Calathea that has those big pleated rubbery leafs. I had that for years,a few years ago. I never kept it outside in winter. 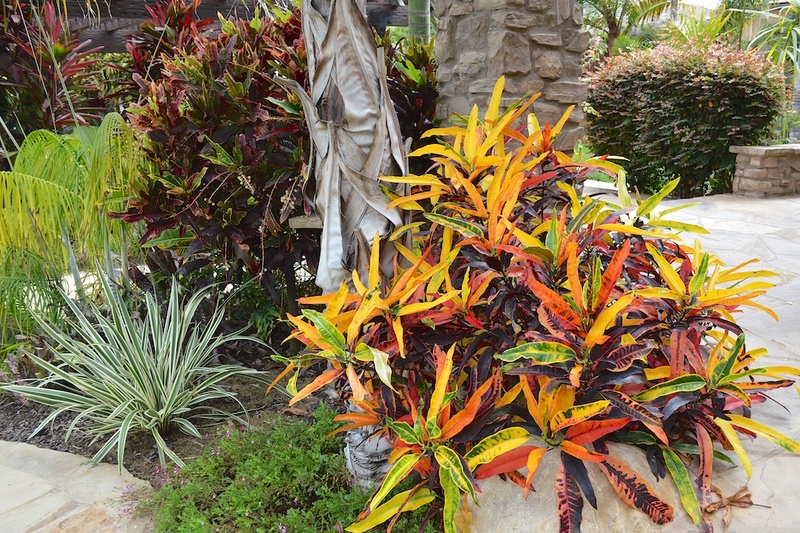 Calatheas are colorful as anything and in many types with cultivars. Just never read anybody mentioning them as outdoor plants. My Crotons bit the dust- a shocker since our lowest was 32f- 33f,one morn, and I did cover them. 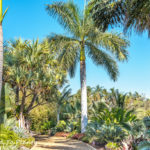 Hey Len,if you are looking for palm vids,the late Hue Howser of California Gold tv show has an episode of the Ralph Velez garden. I think you can ask to add it. Its PBS and educational. Funny,because in the vid Ralph’s wife is about as happy as most wife’s with Hubbies who jam the yards with plants. Cold, wet feet is a killer. Have you tried “Mammy”? That one can handle the wet much better. I would try it up there. Len,How did they handle this wet cool winter? Only one dropped all it’s leaves. They did great. I bought 5 more varieties out of FL to plant. Would you happen to know the best place to purchase California croton seeds? I am a researcher with an institution that needs up to five pounds of seeds but have found it difficult to find a distributor of this seed. Any help would be greatly appreciated. Hi Brigit. Not sure on seed. I know you need to propagate by cutting or airlayers as seed will not come true. Where in Southern California are you located? I am in Palos Verdes Estates, about 2 blocks from the water, on the cliff. I have 5 crotons outside, 2 Petra and 3 Oakleaf. I agree with you, cold, wet soil is their doom. You have a gorgeous garden and your “Mammy” is stunning. One more question, what kind of soil do you have? We have rocky clay soil here, with ok to good drainage. We have a courtyard which does not have clay soil, but loam and that’s where I have my crotons planted, under large eaves. The eaves protect the crotons from winter rains, so I can control their moisture during the winter months. I wonder how they’d do if I plant them out in the open in my garden where I have rocky clay. I have all sorts of palms, ti plants, philodendrons, gingers, bromeliads and other tropicals growing just fine, but I just know crotons really hate wet, cold soil. What do you think? I’m in Vista. My friend Ashton Smith lives in your neighborhood. Plant guy too. My soil is all DG. No clay like you guys have. I bet some of the more hardy cultivars like “Mammy” would be fine. Just as long as the soil isn’t holding water during a rainy winter. Not sure Len,but the one you lost the label to might be “Excellent” I picked one up last spring and it has developed great color and so far in December looks summer like- only now on the porch for winter. Out in more sun in summer.